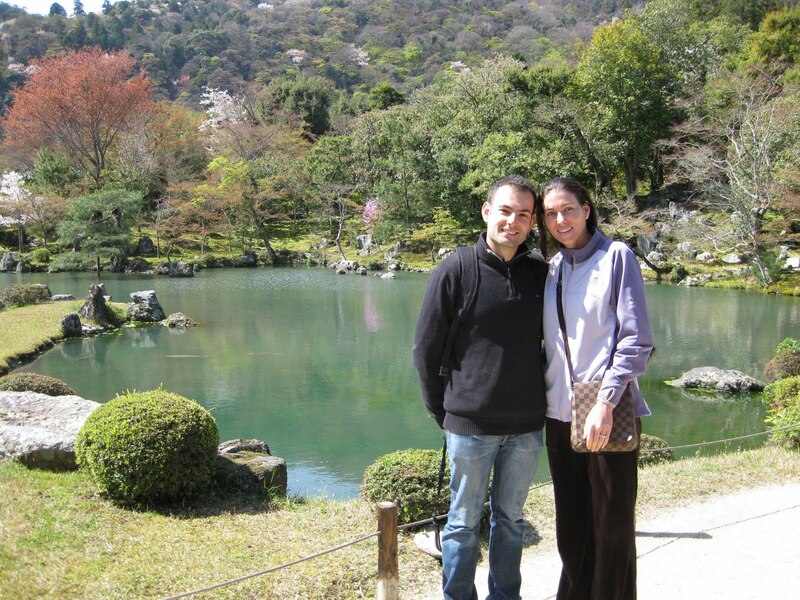 Kyoto private Guide: a tour guide of Honeymoon! Yes! This time I got the honor of being a guide of honeymoon! It was a great pleasure to have a chance to be their guide. After picking them up, we went to Arashiyama area. First we visited Tenryuji temple. 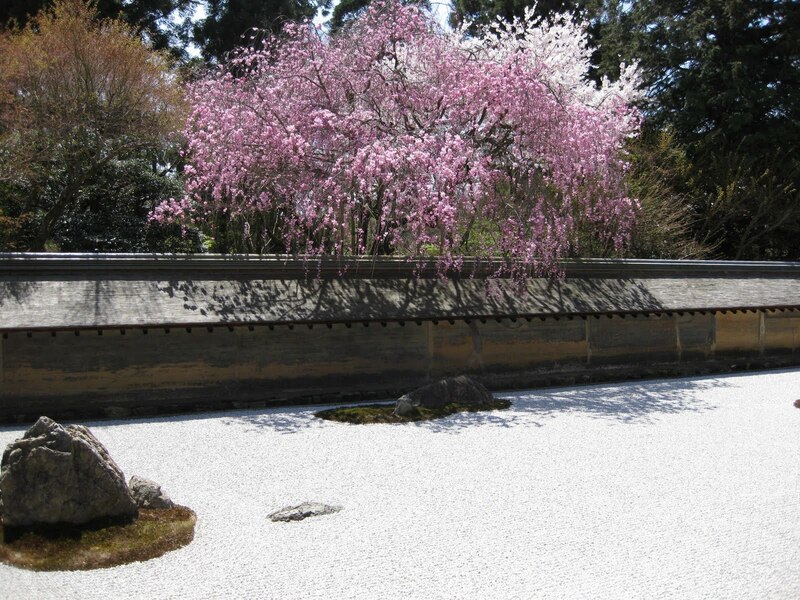 It is one of the greatest zen temples in Kyoto. 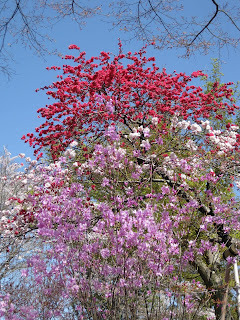 We enjoyed many cherry blossoms over the path in the garden. When we were about to leave the temple from the exit at the back of the temple, we found cute good luck charms with a shape of miniature school bags. It was very cute. They seemed to like it, but they thought they could find them somewwhere else. Unfortunately we could not find the same kind of charms in other places. If you find it and like it in Tenryuji, do not hesitate to have one! Later we enjoyed walking along the path in Bamboo forest and headed for Ryoanji rock garden. Around the pond in the precinct, we enjoyed full of cherry blossoms again. Usually, a rock and sand garden doesn't come with flowers or blossoms. It is said that if there are some flowers in Japanese garden, your attention will be paid only to the flowers and you will sometimes forget seeing the garden as a whole or will not try to feel something gotten by viewing the garden with your mind calm. 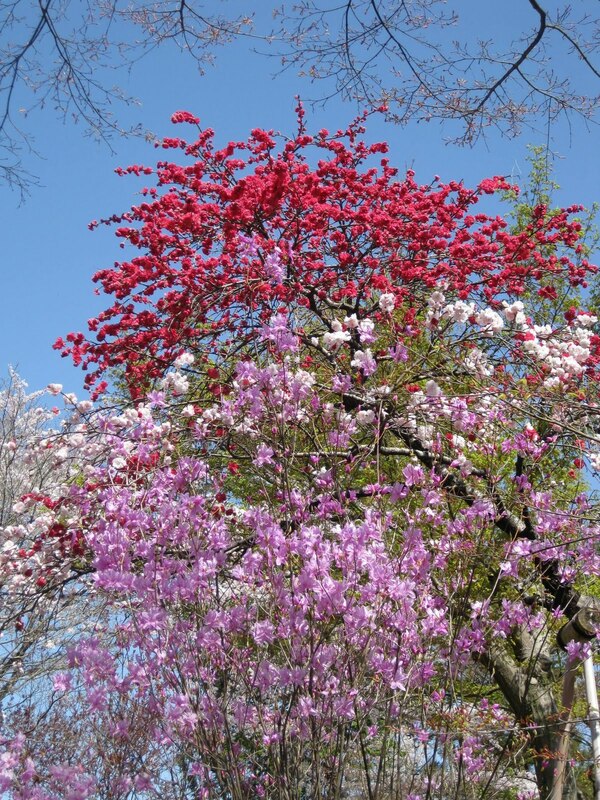 However, only this season gives you the garden with cherry blossoms trailing down from the tree behind the wall. Then we visited Golden Pavillion and had OKONOMIYAKI. They are looking for obi fabrics. They said that everybody had said they were able to find obi fabrics anywhere you went, and that was not true. They were anxious to have one. So I took them to NISHIJIN TEXILE center. Here you can see hand weaving and, of course, can buy some silk fabrics for kimono and obi. Luckily they found what they like, which made me happy, too. After visiting Nijo castle, the tour ended. They promised to send a picture of cusions they are going to make with the fabric after their returning home. I am really looking forward to seeing it!